Tonight we scrambled it up (pun intended) and had Breakfast for Dinner! TOFU SCRAMBLE + alll the veggies. Tofu Scramble with diced onions, peppers and carrots simply seasoned with salt, pepper & turmeric, Hilary’s Veggie Breakfast Sausage, Roasted Potatoes, Sauteed Spinach and Roasted Tomatoes. Savory, nourishing and so delicious! More on Hilary’s veggie sausage… There are two awesome flavors — Spicy Veggie Sausage & Apple Maple Veggie Sausage— to satisfy sweet and savory tastebuds. They are made with wholesome ingredients like lentils, millet, dates herbs and spices. And they are super easy to heat up just like their veggie burgers. Sure to become another pantry staple! Breakfast inspo for anytime! 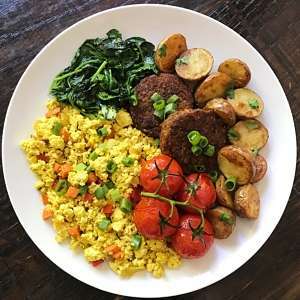 Scrambled Tofu with diced onions, bell pepper and carrots, simply seasoned with turmeric, salt and pepper, Hilary's Veggie Breakfast Sausage, sautéed spinach, roasted potatoes and roasted tomatoes. Nourishing, Savory and Delicious! Post sponsored by Hilary's. Either flavor -- Apple Veggie or Spicy Veggie or 1 of each! Place in a single layer on a baking sheet. Sprinkle with salt to taste. In a large saucepan, heat oil, then add onion and white parts of green onions. Saute 5 minutes. Add peppers and carrots, and saute 7-10 minute until just tender. Stir turmeric, salt and pepper, and cook 1 minute. Unwrap tofu, and with a fork or your hands crumble tofu into bite size pieces directly into pan veggies. Stir to combine and cook an additional 5-7 minutes or until tofu heated through. You can sprinkle with more turmeric at this point if you want the tofu to have even more of a yellow color. Remove from heat, top with green part of green onion and serve. In a medium skillet, heat 1 tablespoon olive oil over medium heat. Add 1-2 minced garlic cloves if using and saute 30 seconds, until just fragrant. Add spinach and saute 2-4 minutes until wilted. Season with salt & pepper to taste.